This is an English version of Swiss Army Knife for WinMUGEN ver. 1.08 by Anonymous. Translated by myself. 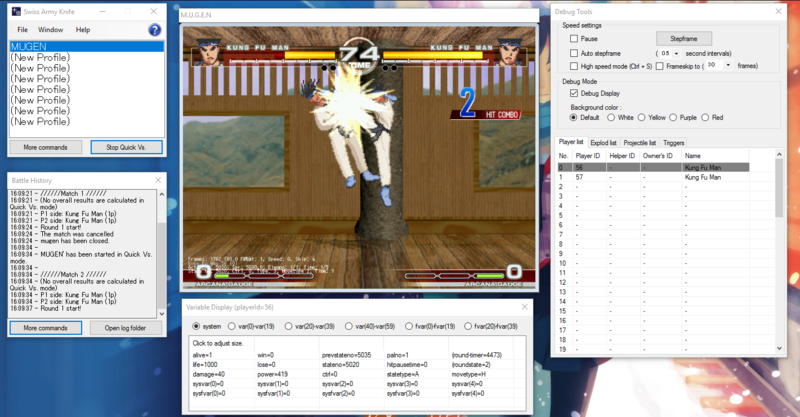 Swiss Army Knife is a debugging tool for WinMUGEN and MUGEN 1.0 that provides a great variety of ways of observing individual player data and variables in real-time. Within the tool, the Help function provides context, explanations and examples on how to use the advanced debugging features. Fully translates the main program into English. Fully translates the Help functions and its examples and explanations. Re-formatted forms and windows to a better fit for English text. You can get it in the Tools section.